The colours we see on screen in a film are often very different than colours in reality. This may have to do with the type of film used, the way the film was processed or the colour grading done in post-production. The way scenes are lit can also affect the colour that we see. I know little about exactly how films are coloured, but it is easy to see that colours on film often do not look realistic. Bond films are often graded to have a certain colour cast. You Only Live Twice has a pink cast. On Her Majesty’s Secret Service has a blue cast, which makes the snowy scene feel colder. Spectre has a yellow-orange cast, which makes the scenes in Morocco feel hotter, but the yellow is out of place in the colder scenes. Some films also have more saturated colours than others. Casino Royale (2006) has very vivid colours that make the locales feel exotic, while Skyfall looks dull to reflect the typical weather in England and Scotland. A shot from the Spectre Blu-ray (left) has yellow colour grading while a production still (right) shows truer colours. The yellow gives the false impression that Mexico City is a hot place, while in reality the climate is similar to London’s. In person the suit looks an even brighter shade of blue than in the photo on the right. The colour grading of the film affect the colours that we see the clothes are. Daniel Craig wears mostly white shirts throughout Spectre, but because of the colour grading we see the shirts as cream. A coloured cast also dulls any colours opposite on the colour spectrum. The yellow-orange cast in Spectre not only emphasises that area in the colour spectrum but dulls the blues. 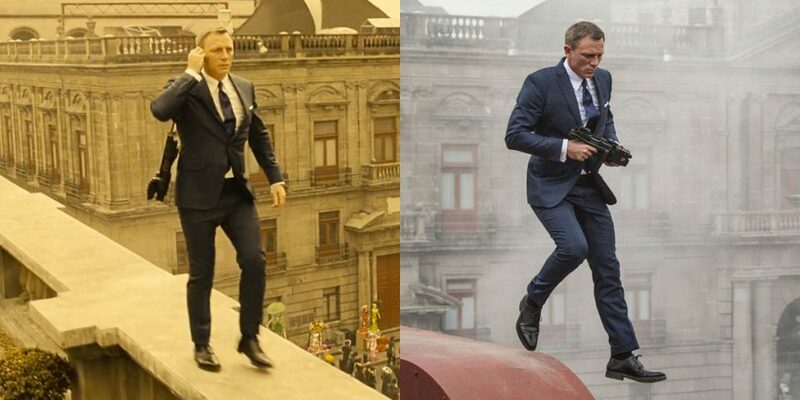 Two of James Bond’s suits in Spectre are bright, vivid blue in reality but dull, dark blue on screen. Set lighting can also affect colours, with bright lights blowing out light colours and lightening dark colours, and dim lighting can dull and darken colours. Sometimes indoor scenes will have an additional yellow or orange cast to get the look of warm artificial indoor lighting, which is common in the more recent Bond films. When I judge what colour an item of clothing is in a film, I take into account if there is colour grading that places a cast over the film and correct the white balance to see a truer colour. Because colours on film can be sometimes be so different from reality, I compare the colours in the original DVD releases with the Lowry remastered DVDs and Blu-rays for different prints of the film. Lowry worked from the original film negatives, but they made their own adjustments. 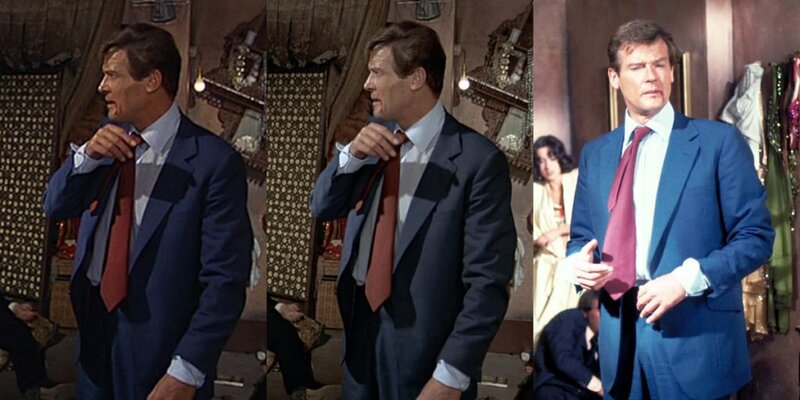 Three versions of Roger Moore’s blue suit in The Man with the Golden Gun. L-R: the saturated colours on the DVD, the dull colours on the Blu-ray, an overexposed behind-the scenes photo. I also look at production stills and behind-the-scenes photographs to get another look at the colours of the clothes. These various sources often show different colours, and I have to use my judgement to determine which is most accurate to reality because none will ever be 100% true to reality. The colours of clothes are easiest to determine when they are most vivid. The colours of very dark or muted suits and very light shirts are the most difficult to determine. I often use another well-defined colour on screen for comparison since so much of the colour we see is based on the colours that surround it. The best sources for true colour are ones I have been able to see in person, such as the Rittenhouse costumes cards and in-person exhibits of clothes—when well-lit. 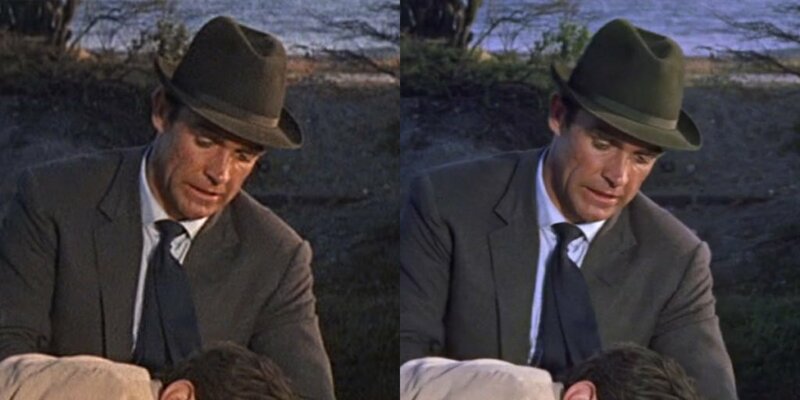 There has been much debate about the true colour of Sean Connery’s trilby in Dr. No. On the DVD (left) it looks like dark grey-brown while on the Blu-ray (right) it looks dark grey-green. The DVD is warmer with browns emphasised while the Blu-ray is cooler with more blues. I try to take note of all the details of the clothes that I can when I see them at the cinema, but in the moment I can’t notice everything or remember everything. I also did not see any Bond films in the cinema before the 1990s. Thus, most of my judgement is not based on cinematic releases of Bond films. Determining a true colour is not only difficult on film but also in reality. Our perception of colour is based on light, and light in our own lives can vary as much as it does in a film. Natural light is the best way to see colours, as artificial light can vary in warmth. Because artificial light is usually warm, it is one reason why evening wear is commonly made in midnight blue rather than black. Black has a brown cast under warm artificial light while midnight blue looks closer to black. And in daylight, true midnight blue appears to be black when there is no true black around for comparison. But even outdoors in natural sunlight our perception of colours can vary depending on season, time of day and air pollution. 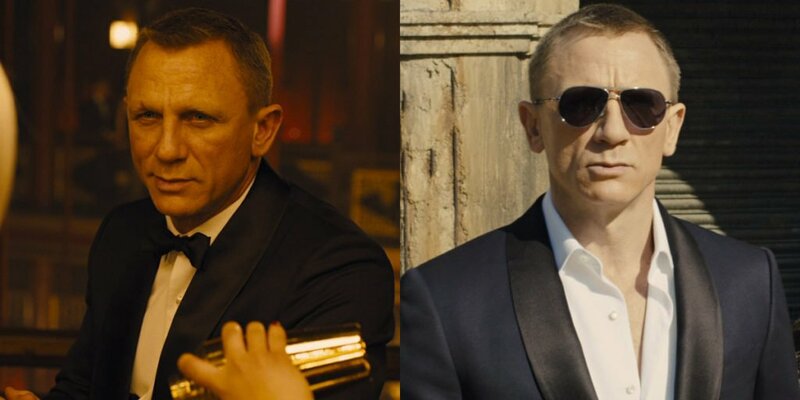 The midnight blue dinner suit in Skyfall: at night under warm artificial light (left) vs under cool daylight (right). Under artificial light the midnight blue body looks black while the black satin shawl collar gives off a brown glow. 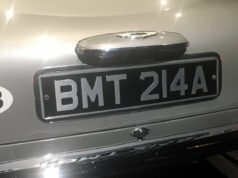 For those who desire to replicate Bond’s clothes, is it more important to copy the colour that appears on screen or the colour that the clothes are in reality? Both are legitimate ways of interpreting the wardrobe, though my preference is to determine the true colours of the clothes. 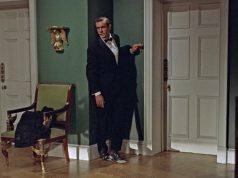 Is there any way to know the exact hues and shades of Bond’s clothing colours? In many cases it is not possible, especially when it comes to subtlety. Without having the real piece of cloth in hand for comparison in the proper lighting conditions, we can never know the true colour. They really did Roger Moore’s suit wrong in the Blu Ray colour mix in my opinion, looks much better to my eye on the DVD version! You’ve mentioned this many times throughout the blog but this really brings home how coloring can get skewed by the various media a scene is depicted within. I have seen film, DVD, Blu-Ray, DVD dust jacket covers and posters all picturing the dinner suit above from “Skyfall” and get as many different hue variations. Like you, I would rather be able to replicate the actual item’s color as opposed to how it’s depicted on-screen. Along with your blog, David Zaritzsky’s The Bond Experience, Daniel Love’s Royale Filmwear and Indy Magnoli’s Magnoli Clothiers have been able to acquire many screen-used pieces with which to replicate the designs and colors used in the films. My hat’s off to all of you for the passion you display for all things Bond and for not being afraid to jump into the minutiae of things like color and fabric weave. I remember seeing DAD in theaters and when brosnan comes out of the yacht club looking like bond i could have sworn the suit was a slate gray and then upon liking at the post it was Birdseye then I made the same mistake in TWINE when brosnan battles it out in the caviar factory but again it was birdseye. I probably have tritanopia and have to look at the crazy isihara test again. Interesting post Matt and your example above of SPECTRE is particularly stark. I clearly remember going to see that at the cinema and thinking someone had draped a sheet of muslin over the screen. I feel like they really over did the process and many scenes give the impression of looking at a fuzzy old sepia-toned photograph. This may not be the place to get into a deep discussion of the merits of SPECTRE but that particular feature stuck out for me right from the opening scene and adds to my conclusion that Mendes may have arguably turned in a decent entry to the series but in some ways he just didn’t ‘get’ Bond. Agreed. Colour grading certainly didn’t help Spectre but the film itself was a mess from about 45 minutes in. 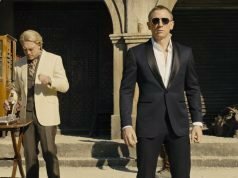 It seems Mendes can’t finish a Bond film off, he got mid way through Skyfall and Spectre and then the quality and logic (not to mention plot and story) takes a massive downturn to the point where it makes little sense, especially with Spectre where the story goes on the ruin the previous three films which is quite frankly unforgivable. At least with Spectre the costume department corrected the sizing of Daniel Craig’s suits from the ultra skinny stuff in Skyfall. I know it’s a matter of taste and the filmmakers (probably) know what they’re doing, but this tinting fad is a real turn-off for me. I watched the “making of” featurette on the Spectre Blu-Ray and thought the Mexico setting was gorgeous, but didn’t remember it that way on screen. So I watched the movie itself, and sure enough it’s hideous. It seems like a waste to have costumers, set designers, make-up artists, etc work to create pleasing visuals if some editor is just going to come in at the end and run everything through a filter that tints it orange or aqua. Over time, this “trendy” but ugly look is going to visually date the films more than safari suits or bell bottoms ever could. The fact that you only notice after it’s been pointed out to you indicates that most people won’t! The entire creative team collaborates on the look in these films — down to costuming and how it looks when tinted a certain colour. See for example The Matrix trilogy, where the real world has a blue tint and the Matrix has a green tint. Costume Designer Kym Barrett, if you watch the featurettes on making the films, is fully cognizant of how fabrics will look with certain lighting and colour correction and chooses accordingly. So, for example, Neo’s coat isn’t actually black — it’s got some charcoal mixed in so the texture will read well with the lighting and colour. So it’s by no means a new thing, nor do individual creatives necessarily think their work is being wasted or washed out. All well and good but I noticed the issue with SPECTRE from the moment it started, not after someone pointed it out to me. Aside from the colour issue, the whole thing looked fuzzy and slightly out of focus – we have all this generational technology that’s supposed to sharpen up the picture quality but the effect in this film seemed to take a big step backwards. I guess I need to clarify: what I did not notice was that the location was attractive. It certainly wasn’t so when I saw the film on the big screen and I’d never have known if I hadn’t watched the DVD extras. It seems a shame to bother with the expense of travel at all if you’re going to completely change the look of a location (especially for the worse). They might as well just film in front of a green screen and composite in whatever “location” they want. However I do agree that once you’ve applied a tint over the entire film, then all the various elements “fall in line” to fit that tint. For me, that didn’t equate to an improvement here, but your mileage may vary. Yeah. Cary Grant’s classic suit in NXNW isn’t a solid light gray suit in reality. Not even close. I assume the tie is, to match how the suit would look on film. Yeah only when I got the book ‘Cary Grant – A Celebration of Style’ did I realise it’s a blue-grey glen plaid. There’s a colour picture on page 38, although curiously in the caption the writer goes on to say how Grant had his jacket vents lengthened to allow his suits to ‘move with him’ in action scenes. This suit is ventless!! Great post, Matt! The color differentiations in the various prints of film are noticeable (for example, I always thought Venice chalkstripe was navy and yet in the blu-ray, it looks gray). But it is fun to see what is on screen vs. what is reality. I was wondering if you would cover this and as usual, you don’t disappoint. I do not agree with some of the SPECTRE-related comments (and I think the film itself is lower-midrange Bond in execution, at the bottom in concept). Hoyte Van Hoyteme is one of the best DP’s in the business today, and SPECTRE is a beautifully well-shot film, certainly at the top of the series in that regard, but for the genre-defining work of the great Roger Deakins in Skyfall. The films are meant to tell a story and convey their thematic elements; cinematography is a key element of what is fundamentally a visual medium. If it changes the way the clothes look on screen compared to what they look like in reality, then that is the creative choice of the filmmakers. This is an age old problem. I first got into screen clothing with David Tennant’s Doctor Who years ago. I would read blog post after forum post on screen accurate cuts and fabric colours. One particularly amusing example which always stuck with me was someone posting a photograph of themselves wearing a Tennant inspired camel coloured long-coat. One of the comments praised the attempt, but went to lengths to point out the colour was wrong. Quite some time later, some keen eyed person noticed some obscure details that confirmed that the photograph used an actual production costume, the person worked at a convention gallery and cheekily snapped a few shots wearing the display items. Even 100% perfect screen used items will always look wrong in the eyes of some, due to lighting, photo quality, tint etc. A constant problem in the reenactment world as well, from what I understand. See the controversy regarding khaki vs. olive drab with WWII U.S. Army uniforms. It’s an interesting topic. I was disappointed in Spectre for other reasons, and like QoS for its relative simplicity and none-gags. QoS has its weaknesses but for me it’s CR > QoS > Skyfall > Spectre… from best to worst. Regarding colour accuracy, as someone who likes to dabble in photography, white balance is very important. Film people call this “grading” I believe. Whatever it’s called, colour alteration is not inherently “wrong” and we all see the world slightly differently. As for your question regarding on-screen vs “real”… that’s much more interesting. A dark blue (not Navy) suit could therefore still be “Bondian” in nature. Whether the literary Bond would wear such a suit _now_ is an interesting question. Fleming was dressed for his era, and Bond too. The era is different now. Bond may wear more than charcoals and navys… but as a spy… he’d probably stick to these to “blend in” (something Casino and QoS did better than Spectre imo). I like to have a variety of suiting, and like Bond’s general style. This discussion now enables me to justify a something slightly different to navy or charcoal for my next purchase. Amazing in depth work as always! i recently purchased ‘the spy who loved me’ on an old DVD. the colors are quite funny, the Tan sport coat (https://www.bondsuits.com/tan-cotton-sports-coat-spy-who-loved-me/) changes colors so drastically between camera cuts, you would swear there were two different ones! it goes from almost matching the pants, to contrasting quite a bit. Is Craig’s Spectre suit that brighter (cerulean?) blue that I’ve been seeing all over London for the past 3 years and NYC for at least a year? I’m not sure if it fits Bond as a character or a spy but it sure is popular in London! Yes, Craig’s blue suits in Spectre are the brighter blue that has been popular. It hasn’t been popular since the 1970s.